Ron Sandford’s work is defined by his incredible draughtsmanship in drawings which are full of life and character. Typically, Sandford uses very little in the way of colour – relying on the pencil or pen and ink to create interesting variations in surface, line and pattern. The idea of place has been a constant interest within the artist’s practice. His work is full of jagged rocks, coastal views, old crofts, trout, interesting neighbours and agriculture – owing to his settling in the Shetland Isles. 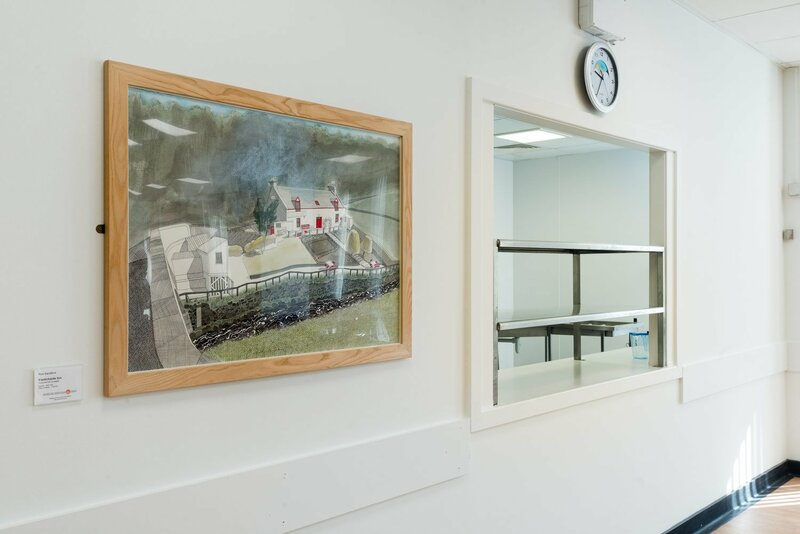 The work selected for the refurbished Staff Cafe was taken from Sandford’s ‘Speyside Way’ series, giving a look at some notable areas much closer to home, not least of all some of the regions famous distilleries. These works are full of intricate and impressive detail but, with just hints of colour, do not overpower the space. The result is a new area which feels fresh and calming – a terrific open space full of natural light which is ideal for meeting the needs of staff, creating a positive and relaxing environment to enjoy.